You can’t go wrong with deep-frying your food. Deep-fried food is always good to taste with an aromatic crisp texture to the palate. Often, fried food is perceived as unhealthy, fattening, and “heaty” stuff due to excessive oil absorption to the food, excessive repetition in using the same oil to fry, and consume too much piping hot stuff will cause ‘heatiness’ in our body resulted to ulcer, sore throat, and even fever, as Chinese believed. However, fried food is one of the most popular cooking methods, be it for commercial purpose, business or home-cooking. For meaty or vegetarian food, we just cannot totally eliminate fried food in our diet, can we? It’s just too hard to resist the temptation of having a bite or two, sometimes. I like fried food, from breakfast food to supper meal. Tell you what I normally take…. Doughnut or curry puff for breakfast, fried sweet potato or spring roll for tea break, fried chicken wings to go with fried bee hoon or nasi lemak (coconut-milked rice), fried fritter to dip in Bak kut teh soup (Meaty Ribs Herbal Soup), fried vegetable patty, meat, poutry, seafood…. and etc. It is not necessary to use a deep fryer to do the good frying task. By using a wok can easily obtain the same effect, trust me! Frying food at home seems healthier. We have full control on the choice of oil. Choose vegetable oil. Not palm oil, but canola, peanut or sun flower oil instead. Do not reuse the oil. Throwing away the oil after one time use might seem wasteful, but it is surely not good to reuse it! Some said oil used to fry potato or any other starchy food can be re-used. Some said oil used after frying fish should not be kept and reused. I am not very sure how true were these saying, but I personally do not believe in storing and recycling used oil. This is because heated oil will combine oxygen in the air which yields free radical. When we re-use this heated oil to fry new food, this fried food will carry free radical and being consumed into our body. Free radical may cause the increase the risk of health problems like cancer, cardiovascular illnesses, reduce body immune system and etc. Oh well, I do use the same oil to finish up the entire frying of all food on the same day, but never strain and store it overnight (smiling). Heat the oil over high temperature, the oil must be heated hot enough at certain temperature, but never too smoky before hitting to the oil. Hot oil does good frying, with hot oil at correct the temperature, you will obtain the effect of “crisp and golden outside and tender inside”. Otherwise, your food will retain more grease and soften. Cut the pieces in uniform size to obtain better control when frying. Consistent temperature throughout the frying process is essential, too. Use medium – high fire (about 370ºF) for shallow or deep frying, and low fire (about 360ºF) for pan frying methods. To test the temperature of the oil, use a deep-frying thermometer. It’s ok if you do not have one, try dropping a small piece of food into the oil. If the piece creates bubbles in the oil and float to the surface immediately, this indicates the oil is heated enough and ready for frying. Avoid putting too large portion of food in the oil at one go as too much food will lower the temperature of the oil, and thus affect the frying effect. Hence, frying food in small batches is recommended. To keep your food warm and crisp before serving, leave your fried food in the oven with about 280ºF heat. Food-frying has to be a little more patient, do not set fire to too high heat as it will result to over-cooked on the surface of food, but undone inside. To avoid oil splashing when dropping food into the oil, sprinkle a pinch of salt before frying. For more crispiness, try “double frying” method. Fry your food till lightly golden browned using medium fire for the first time. Remove from wok and drain oil for about 3 min. Return food to the wok over medium-high fire, for second time frying, until golden browned. To anyone who likes to reduce oil intake from fried food, it’s of course important to prevent excessive oil absorption in your fried food, quick fry the food for another 15 seconds over very high fire, before heat off. Then, remove from wok using large tong or strainer, and drain on kitchen towel. I remembered in those early days, our granny liked to drain fried ‘ikan bilis’ on newspaper. Granny claimed that newspaper will help to make fried stuff even crispier. I never knew how true this myth is, but I think old newspaper is not the option to me due to hygiene issue. I opt for brown paper instead of old newspaper, if I were to really drain on paper. Drain on the wok rack or kitchen towel are good enough indeed. To further drain my fried food, I use another sheet of kitchen towel to squeeze and press on the food again, before consumption (chuckling). 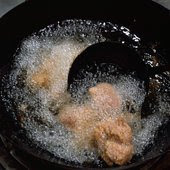 Deep-frying method– Use a large wok/ deep saucepan or electric deep fryer, and add oil to fill the utensil half full which enough to cover the food entirely. Oil has to be heated over medium-high fire (about 370ºF). Deep frying method is most suitable for frying chicken drumsticks, french fries, meat balls, and more ‘dimensional’ food. Deep frying requires plenty of oil. 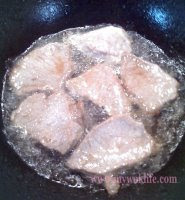 Shallow-frying method – Use a wok/ large pan or electric skillet, and add oil to about ½ or 1 inch deep which enough to partially submerge the food. I like to use this method as it won’t waste too much oil. Just fry one side of the food, and then turn over to the other side again. Oil to be heated over 370ºF. 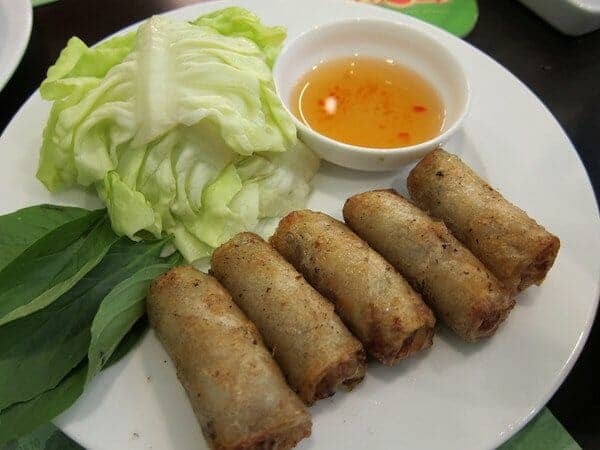 In fact many deep-frying food can be fried using shallow frying especially for cooking patty-like food, for instances, fish fillet, pork chop, vegetables, and etc. Pan-frying – Use pan or electric skillet, and add oil which enough to cover the bottom of the utensil will do. Oil to be heated medium fire at 360ºF. Pan-frying method is good for frying food which easily cooked, for instance, eggs, pan cakes, steak and etc.